Brandon Routh has played some very iconic roles in recent years -- from the Man of Steel in Bryan Singer's Superman Returns, to Agent Daniel Shaw on the hit NBC television series, Chuck; but now Routh has returned to become a new iconic film figure, Dylan, in the Italian comic book turned motion picture film, Dylan Dog: Dead of Night. Dylan Dog: Dead of Night is based off the successful Italian comic book series, by Tiziano Sclavi, about a private investigator who is the "pseudo" police for all things that go bump in the night in the City of New Orleans, Louisana, -- including vampires, werewolves, and zombies. Dylan has taken a leave of absence from his supernatural investigating days until the damsel in distress, Elizabeth (Anita Briem, Journey to The Center of The Earth) needs protecting from the supernatural, and his best friend/partner, Marcus (Sam Huntington, Superman Returns) is killed and has come back to life as a zombie. After its initial theatrical run, Dylan Dog: Dead of Night was considered one of the biggest box office flops of 2011 (at the time of this publication Dylan Dog: Dead of Night has a 3% on Rotten Tomatoes) -- only bringing in approximately 4 million dollars from the box-office -- not even close to its 20 million-dollar- budget. However, in general, this film got a bad reputation for being nothing more than good, fun, supernatural time. While the acting will not win any Oscars, Brandon Routh once again proves that he can be the leading man and carry a film bringing great humor and charisma to the role of Dylan Dog. Veteran actor, Taye Diggs (Day Break, Go, Equilibrium), also pulls off a great performance as Vargas, the vampire with a secret agenda. However, the rest of the cast seems to be just cannon fodder. Sam Huntington brings to the table the same dull acting he did in Superman Returns, while leading lady, Anita Briem, seems to just be in the film for eye candy. With the box office numbers the way they were for this film, it appears that the studio did not want to throw much love and care into its Blu-ray release. Dylan Dog: Dead of Night is released on a barebones BD25 disc that does not contain any special features-- not even the trailer. The video itself is a bit harsh with some heavy DNR (digital noise reduction) done to the print. The audio is only presented in DTS-HD Master 5.1 that is not demonstration quality, but does live up to the film. 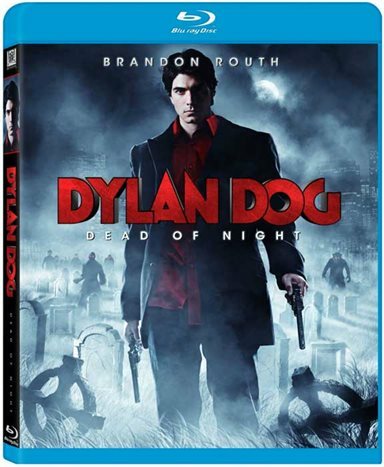 If you are a fan of such television shows as Buffy The Vampire Slayer, Angel, or Dresden Files, then Dylan Dog: Dead of Night is a fun film that you will enjoy. If the mention of such titles turns your stomach upside-down, then I would suggest passing on picking up this release. Download Dylan Dog: Dead of Night from the iTunes Store in Digial HD. For more information about Dylan Dog: Dead of Night visit the FlickDirect Movie Database.